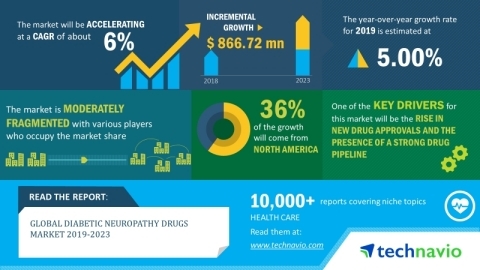 The global diabetic neuropathy drugs market is expected to post a CAGR of more than 6% during the period 2019-2023, according to the latest market research report by Technavio. The prevalence of diabetic neuropathy is increasing at a rapid pace, resulting in the growing need for disease-modifying drugs for the treatment of this disease. As a result, several top players are developing new drugs, and many of these drugs are being approved in the market. For instance, in September 2015, capsaicin 8% cutaneous patch (Qutenza) was approved. Hence, with new drug approvals and strong drug pipeline, the market is expected to grow during the forecast period. As per Technavio, the development of novel biologics to treat diabetic neuropathy will have a positive impact on the market and contribute to its growth significantly over the forecast period. This global diabetic neuropathy drugs market 2019-2023research report also analyzes other important trends and market drivers that will affect market growth over 2019-2023. With the significant increase in the prevalence of diabetic neuropathy, the established players in the market are continually focusing on the development of novel biologics for the treatment of the disease. For instance, vendors are in the process of developing drugs for the treatment of diabetic foot ulcers and diabetic neuropathies. Currently, such drugs are in different phases of clinical trials for diabetic peripheral neuropathy, peripheral arterial disorders, and diabetic foot ulcer in the US. The development of novel biologics to treat diabetic neuropathy will drive the growth of the diabetic neuropathy market during the forecast period. “Diabetic neuropathy is the most common complication associated with diabetes. Therefore, creating awareness among the population about diabetes and its related complications has become very important. Hence, several programs are being initiated by many countries across the world to bring awareness regarding diabetics. For instance, in India, the National Diabetes Educator Program was initiated with the primary aim to educate and train diabetes educators in the country. Such initiatives will directly impact the growth of the diabetic neuropathy drugs market during the forecast period,” says a senior research analyst at Technavio. This market research report segments the global diabetic neuropathy drugs market by the mechanism of action (calcium channel alpha-2-delta ligand, SNRIs and TCAs, and others) and geographic regions (North America, Europe, Asia, and ROW). The North America region led the market in 2018, followed by Europe, Asia, and ROW, respectively. The market growth in North America can be attributed to the growing prevalence of diabetes, which has led to an increase in the prevalence of diabetic neuropathy in the region. More From BioPortfolio on "Global Diabetic Neuropathy Drugs Market 2019-2023| Development of Novel Biologics to Boost Growth | Technavio"